At Samaritan Dental we have two top endodontists. 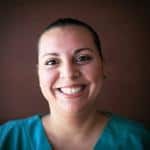 Dr. Eva Guerrero has earned her board certification as an endodontist, and has been working for the past 11 years focused exclusively on root canals. She is one of our patients favorites, and is practically pain free, with a very soft touch. 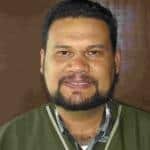 Dr. Gaston Castro is not just a general practitioner trying to do root canals, but he is a board certified endodontist. He has even served as the President of the National College of Dental Surgeons in Tijuana, the counter part of the American Dental Association in San Diego. Root canal treatments are very expensive in the US, so many people come to Samaritan Dental in Tijuana, Mexico for root canal therapy. In Tijuana, Mexico, root canals prices start from $265. Then there is the cost of placing a cast post and doing for $100, and then, of course the cost of placing a crown. In the past, teeth with diseased nerves have been removed from the mouth. However, through a root canal, most of the diseased teeth can be salvaged. In most cases, the root canal procedure is a simple treatment that involves little to no patient discomfort. Root canals allow the dentist remove the pulp, clean the canal and seal the tooth, effectively protecting and saving the tooth. After an opening is created through the crown of the tooth into the dental pulp chamber, the pulp is removed. The canal is cleaned out, and the pulp chamber is permanently filled. Your Tijuana dentist will proceed by putting in a temporary filling. Afterwards, the temporary filling will be replaced with a permanent filling or a crown, depending on the location of the tooth within the mouth. It is certainly cheaper to have regular checkups, and when a cavity forms, have it filled, than to wait until you need a root canal. Too many times, people put off going to the dentist until something begins to hurt. By that time, they are looking at the costs of a root canal, if they want to save the tooth. When a cavity has eaten away enough of the tooth that it gets close to the pulp chamber, you will need a root canal, even if you don’t yet have a terrible tooth ache. A tooth ache is because the pulp has gotten infected, and now we need to get the infection cleared up. But even if an infection has not yet set in, if the cavity is too close to the pulp, you will always have a lot of sensitivity without a root canal. Often people wait until they have a bad tooth ache. But when this happens, a root canal can’t be done right away. The infection has to first be cleared up. The dentist will first open up the tooth to let the infection start to drain. This will start to alleviate the pain as well. He will put you on a course of antibiotics for a week, and then you will have to return to finish the root canal. 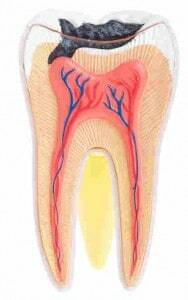 When a root canal is done, all the pulp, including the nerve and the blood supply, is taken out. The tooth is hollowed out completely, down to the bottom of the root. The conduit, or root, is then filled in. A post will then be inserted to strengthen the tooth, and the rest of the tooth is filled in with resin composite material. It is necessary to then cap the tooth with a crown. With no pulp, the tooth is essentially dead. It can become brittle. It is not a good idea to simply stop with a root canal. Without a crown to protect the tooth, a tooth with a root canal could eventually break. If too much beaks off, and the root is effected, the tooth will then have to be extracted. What if you still feel some pain after a root canal? Occasionally a patient will complain about some discomfort after a root canal. This is not uncommon. in certain teeth it is common to have discomfort with biting for a period of time after completion of the root canal. Having some discomfort or pain after a root canal is not uncommon. This is often due to an inflammatory process necessary for healing. Discomfort within the first couple of weeks can be well within the normal range. It is not that part of the central nerve was left, but that there are microscopic nerve endings that branch off from the central nerve. These sometimes get inflamed. In most cases, there is nothing more than some slight discomfort, which goes away shortly. 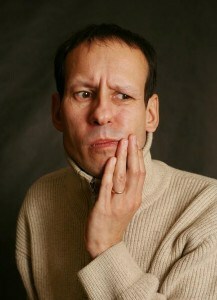 But there is an occasional tooth that will continue to be sensitive for several days, even up to a week or more. These nerve endings cannot be removed by the files the endodontist uses, but can only be chemically deadened with a medication. The dentists could treat for this problem every time by treating the tooth with some medication that would kill off those nerve endings. However, they try to avoid that as there are some side effects, such as the tooth becoming brittle. Also, many of the patients that come to a dentist in Mexico are under a time crunch. They need to get things done quickly, and the medication to deaden the nerve endings will set treatment back by a couple of days. Since the vast majority of teeth after root canals don’t have this problem, you just don’t know until someone continues to feel discomfort. Usually, the best thing to do is to be patient, and take anti-inflammatory meds, like ibuprofen. Usually, in a few days the sensitivity will diminish, and there will be no more discomfort. If it continues, if you can be patient, it will eventually go away. The only other solution is to remove the crown, open up the tooth, put in the medication, and then start over with the core build up and making a new crown. At Samaritan Dental, they do guarantee the work, and would do all this extra work at no charge.